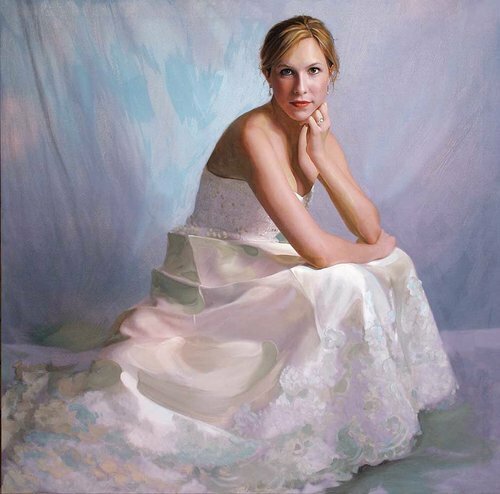 Artist Stacy Hatley Carter’s detailed pastel artworks are filled with light and color, and immerse the viewer in the realistic portrayal of their subjects. Please visit her website for more. I am a portrait, seascape and landscape artist that strives to amaze my clients with ultra realism and a deep immersion with my drawings. I develop the drawings with my fingers and nubs of pastel. Whether the subject is waveform, tree silhouettes or soft modeling on the flesh, I become immersed in the magic of light and interplay of shadows to produce poetic objects on paper. I have always been a tactile artist and love the process of rubbing my fingers on the paper to produce soft graduations of light and modeling. My process of drawing with pastels is simple and straightforward; because of the nature of pastel I need to be sure of my marks since there is minimal room for reworking. I normally work for weeks on paintings, refining a realistic presence and capturing the object’s personality. I obsess with the details, capturing a moment in time, and creating realistic works that display the magic of light and shadow on the page. Although I am primarily known as portrait painter, I also love classicizing close up views of ocean waves and treescapes. One example of this is my non-figurative work, “Rough Seas Seascape” which is a close-up composition of an ocean scene, refined with striking detail at the moment a wave breaks. I was looking to preserve an exact moment, unlike other ocean scenes capturing the whole scene of sand, sky and ocean. I wanted my artwork to immerse the viewer in a moment that will never quickly come again. I love large scale drawings and paintings, because I want the viewer to feel that sense of immersion with the subjects as they stand in front of my art. Artist Stacy Hatley Carter invites you to follow her on Facebook and Instagram. Admirable and unique, Bravo, Stacy. realistic art with clear colors of artist inner soul.. Very elegant depiction of sea and sky! Beautiful visual feast! !